← Vote For MamaMember Margaret Bernstein & SAFE Project for schools re: Pepsi Refresh- ONE WEEK LEFT! 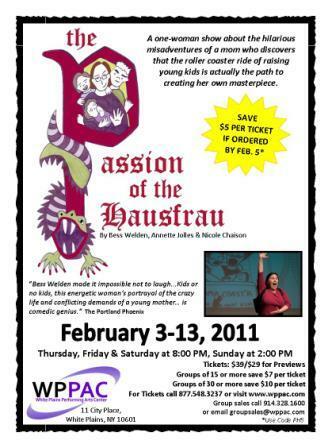 The Passion of the Hausfrau–the show–is making its first New York appearance, at the White Plains Performing Arts Center, February 3rd through the 13th. Come watch the show The Portland Phoenix described as “comedic genius.” And spread the word! I’ll be there selling books and enjoying the show. Hope to see you! 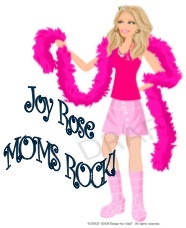 This entry was posted in Music, Art, Comedy, Journaling, Poetry, Self-Expression and tagged Housewives On Prozac, Mom Made Theater, Nicole Chaison, Passion Of The Hausfrau. Bookmark the permalink.